← In a Vase on Monday. Potty! Number one for November has to be the chrysanthemum. I don’t grow the big mop heads. They are beautiful but they always remind me of over-primped, botoxed and made-up ladies who spend too much time at the hairdressers. Very high maintenance; the ladies and the chrysanthemums. I prefer the daisy and small double chrysanthemums which come in such pretty colours. Chrysanthemums start blooming in October but I avert my eyes and refuse to acknowlege them until November. I do the same thing with bulbs which are showing their noses. These have to wait until after Christmas to be gloated over. In the darkest months horticultural pleasures are scarce and have to be spread out and not enjoyed all at once. 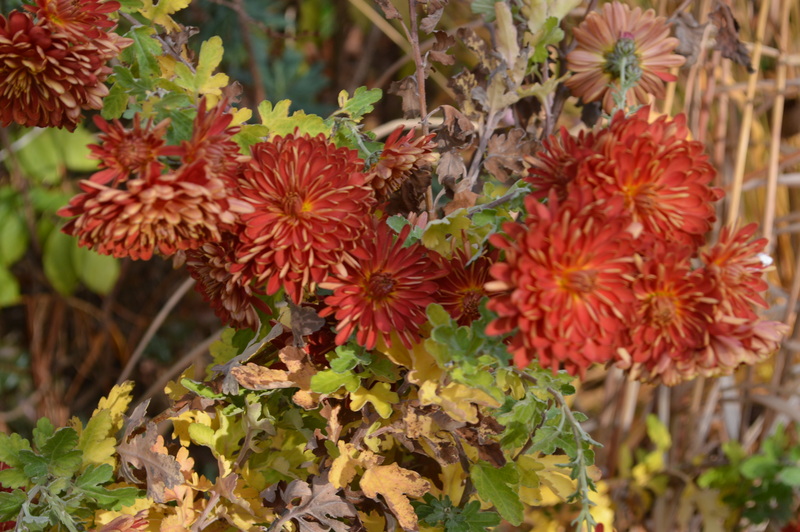 There are enough floral treats in October but after the first November frosts then chrysanthemums are the stars for me. I will start with my favourite ‘Chelsea Physic Garden’ which has double flowers with red petals burnished with gold. Number two on my list is this beautiful Coronilla valentina subsp. glauca ‘Citrina’ which is rarely out of bloom. It is at is best in November and throughout the winter unless the weather is particularly awful. It smells divine and wafts its fragrance round the garden. It is not considered to be completely hardy but mine has lived outside for several years. Its name is a bit of a mouthful but it is a gorgeous plant. If you remember that coronilla means crown you will see it makes sense; it has crown-shaped umbels of lemon-coloured flowers. It has been given various English names such as ‘Crown Vetch’ or ‘Scorpion Vetch’, but I have no truck with made up names for plants with perfectly good, if a little long, Latin names. Coronilla is a member of the pea family; leguminosae. I always remember this by thinking of it as: ‘Le’ go mi nosey’. My third plant is one that is new to me this year. Bidens heterophylla ‘Hannay’s Lemon Drop’. I have grown the pretty little annual bidens for years, but this is a late-flowering and very tall perennial. I don’t know if they usually flower so late but mine was very late to open its flowers and it is a very welcome sight on a November day. I can never resist daisy flowers and this has lemon daisy flowers tipped with white. 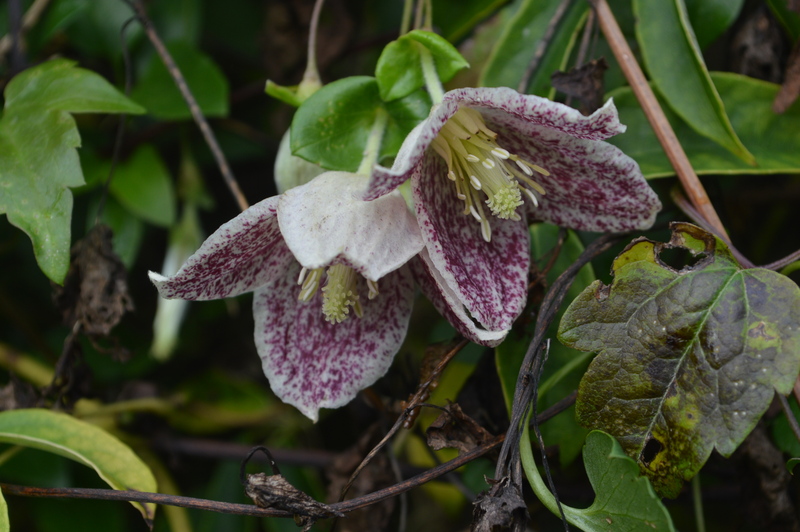 My number four is the lovely Clematis cirrhosa var. purpurascens ‘Freckles’ which blooms throughout the winter months. And it is a very welcome sight too with its maroon freckles. There are still some roses blooming away but I have chosen one that blooms for about eight weeks in the early summer and then after a little rest will bloom right into the winter. I love single roses and this one is an absolute beauty; the flowers start off coppery apricot and finish pink. It is Rosa x odorata ‘Mutabilis’. It is a china rose and so needs a sheltered spot. In fact it used to be called Rosa chinensis, I’m not quite sure when the name was changed. Another China rose which seems to bloom all year round with just the odd break is Rosa chinensis ‘Bengal Beauty’. The flowers look like flights of red butterflies. I know a lot of people don’t like mahonias and I hate the creeping one which gets all over my garden and is so difficult to eradicate and seeds everywhere. But I like the spiky, evergreen foliage of Mahonia x media ‘Charity’ or ‘Winter Sun’. ‘Charity’ is getting over here but ‘Winter Sun’ is still looking good. These winter flowering mahonias smell faintly of Lily of the Valley. 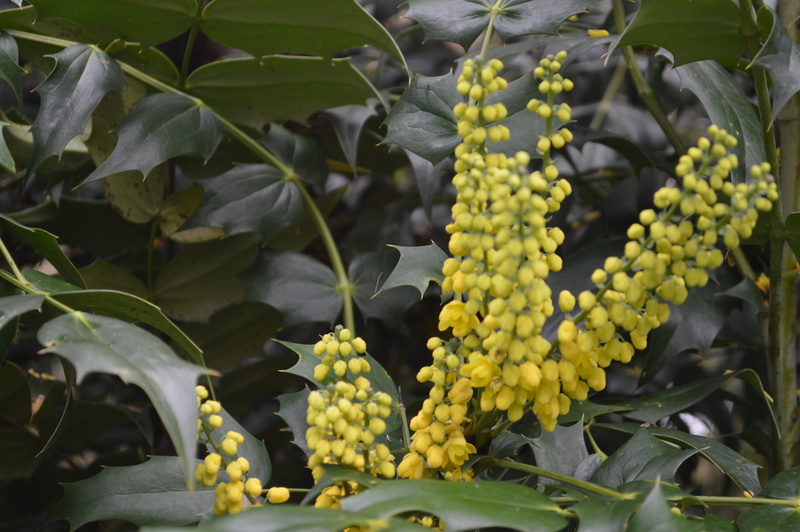 But for a strongly scented one the late winter/ early spring flowering Mahonia japonica is the one to go for. My only complaint about these mahonias is that I have too many of them. The previous owner here seemed to be mad about them, along with the evil, wet dog -smelling Viburnum tinus. The other problem is that mahonias can grow very tall and gawky, with flowers so high up that only the birds get to appreciate them. But they are easy to chop down to a knobbly bit in spring. 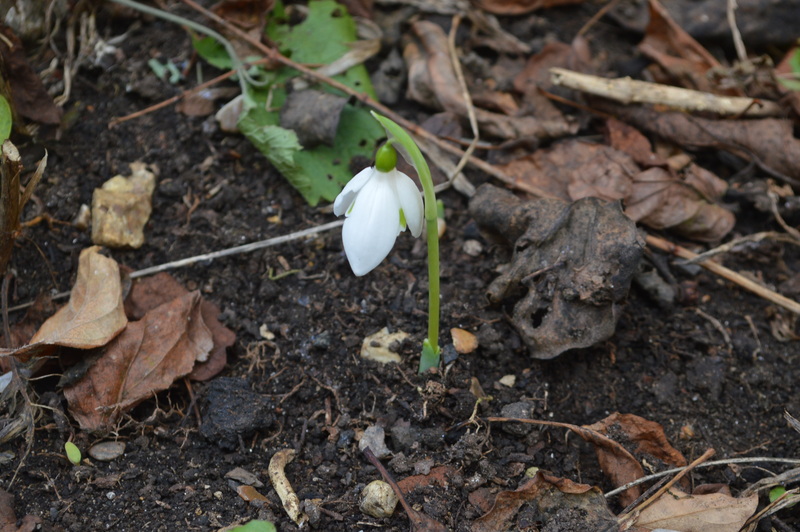 This month’s snowdrop is the dear little November- flowering Galanthus elwesii ‘Barnes’. I have several different cyclamen and some of them live in pots in the greenhouse. 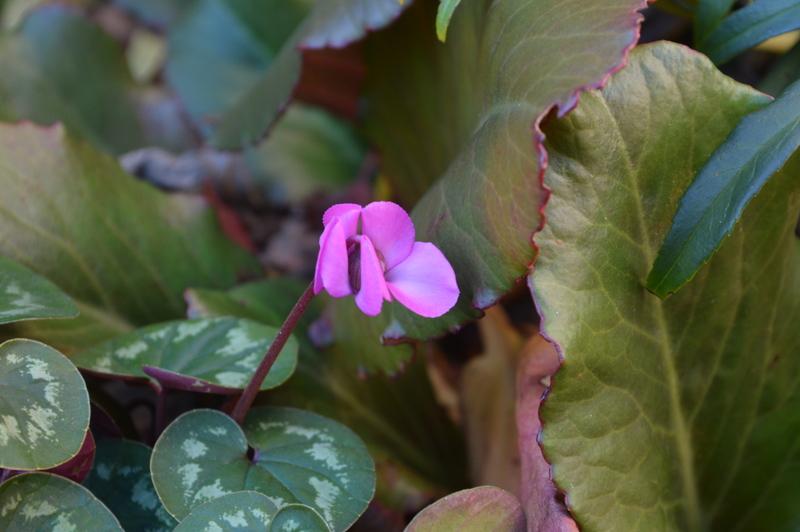 But outside just as Cyclamen hederifolium starts to go over, the winter flowering Cyclamen coum takes over. This one is a little early but very welcome. I am really keen to focus each month on flowers which are blooming in the proper season. November is a bit tricky though and many of the flowers out now are hangers on from summer or early winter ones. I have a foxglove in bloom and also a hellebore. 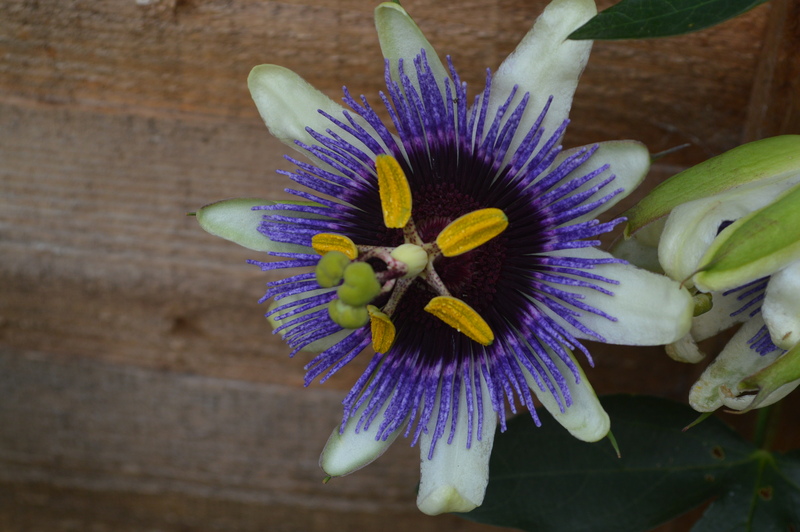 I have mentioned my lovely Passion Flower , Passiflora caerula ‘Silly Cow’ before. It is still blooming away. Silly Cow’ is indeed silly blooming so late when the frosts are around but the delicate-looking Iris unguicularis is quite safe and will bloom all winter long. I like to pick it in bud and watch it unfurl in the warmth of the house. So there are my top ten November bloomers. Please join me and show us what you are enjoying in the garden in November and if flowers are getting a bit thin on the ground outside, then show us just one or two. Or maybe you have some fabulous blooms in the house or conservatory to share. You have a magnificent range of blooms this November. Seeing all the chrysanthemums in on-line posts, I started looking for plants here but the supply can be described as boring at best. My roses are making a very tentative comeback now that the scorching temperatures are gone (although yet another summer-like spell is expected this week). I’ve been checking my own Mahonia ‘Charity’ regularly for any sign of buds but so far there’s nothing and the plant itself, which took a beating this summer, doesn’t look great having lost a lot of its lower leaves but I’m trying to be patient with it. I do try to have lovely blooms every month of the year but winter can be quite a challenge. How strange your Mahonia ‘Charity’ has not bloomed yet and mine has nearly finished. I find that the leaves turn red when they get too dry and stressed. I suppose it’s not sign of good health but they look lovely. I’ve only had ‘Mutabilis’ since February when I planted it bareroot but it has already become my favourite rose. The colours are just divine. Flowering in November is the icing on the cake. 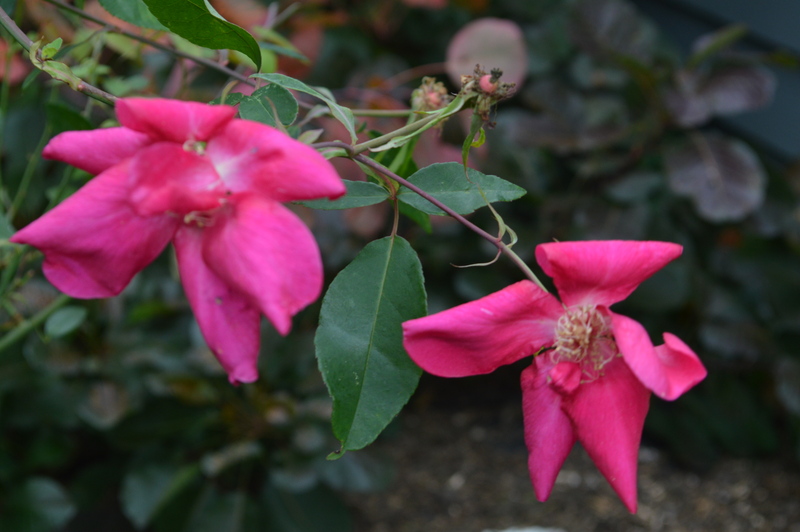 Mutabilis is fabulous and Bengal Beauty is another gorgeous China rose. The iris and the clematis are rad. So are the daisy like chrysanthemums. I do not see much of the overly primped ones around much, even as cut flowers. The big mophead ‘mum are usually grown in greenhouses here by people with too much time on their hands. I saw Iris unguicularis growing all along the south facing wall of a house mixed with nerines the other day. They enjoy the same conditions and between them ensure a display from October until spring. The Iris is a bit early, it usually gets going in late December. I do appreciate flowers that bloom in winter. They cheer the heart. Your Bidens heterophylla ‘Hannay’s Lemon Drop’ is a good find. It doesn’t seem to be available here. Did you grow it from seed? It was new to me this year. I bought the plant, I haven’t seen seeds offered. It is very pretty, I hope it will prove to be hardy. I know you have a sheltered garden, but I am still amazed at what you have in flower this month. How wonderful! 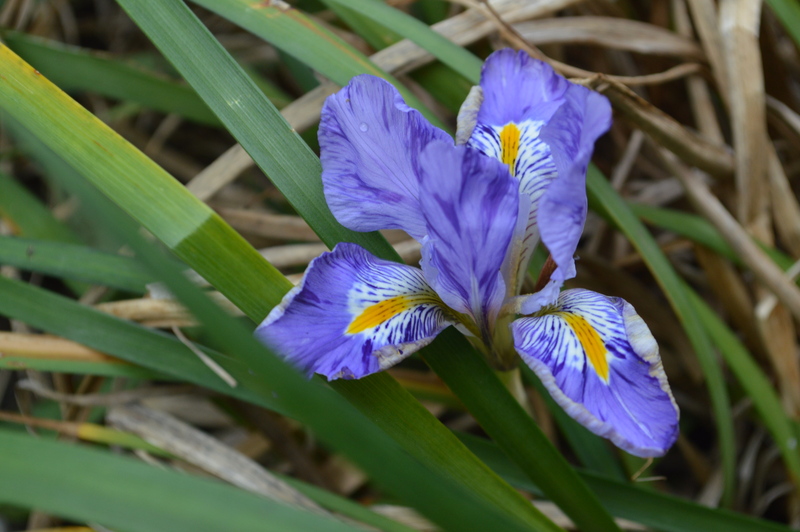 The little Iris are especially sweet and a lovely sight in winter. 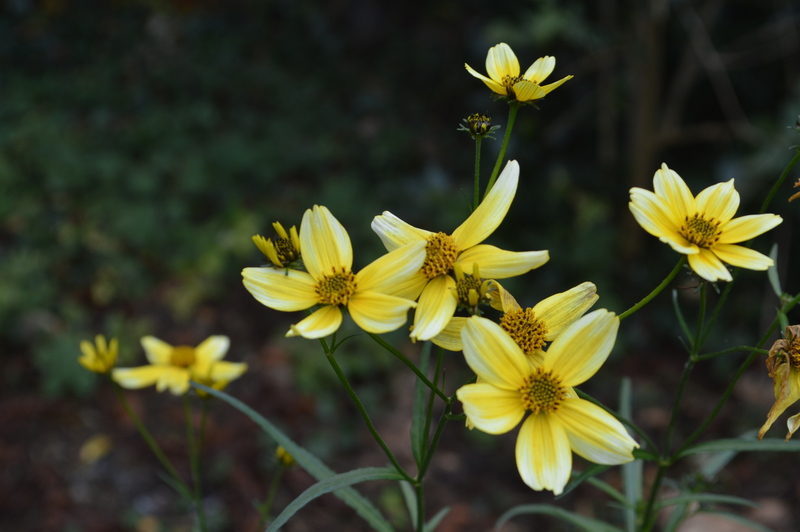 Also, I didn’t know there is a perennial Bidens…. I wonder how hardy it is. I couldn’t possibly find ten blooms to share this month, but will try and find a couple I can post about to join you We have some sunshine coming our way later this week and I will make the most of it! The iris is perfectly hardy and blooms all through the winter. I don’t yet know how hardy the bidens is but so far it is quite unscathed by the frosts that have blackened the dahlias. It will be lovely to see what you have blooming in November. Impressive array of lovely November blooms. Your post makes it very tempting to add some chrysanthemums to my garden. Thank you Peter. Oh yes, I certainly think you need some chrysanthemums. I am sending you Galanthus ‘Robin Hood’ tomorrow, I promised it to you last winter and never got around to sending it. Today I noticed it is just showing its head. I will pop a few bits of chrysanths in the box too. I do try to have blooms all year round. It is sad to walk round the garden and not find anything to enjoy. Winter blooms are specially exciting. I remembered envy last year over your Mums, especially Chelsea Physic Garden and the Roses. We have native Bidens alba here, I curse it, but use it in vases sometimes. I think I need a Silly Cow just for the name. Would like to see the Iris/Nerine border, my Nerines are still 2″ tall. Bah. Knew Snowdrops were coming and there it is! All in all, November looks lovely in your garden. Thank you Amy. I hope your nerines will grow and bloom and delight you soon. Silly Cow is fun and has huge flowers. December is going to be a problem though after such hard frosts. Still one likes a challenge. Liz, I thought of you this morning when I realized the Nerines had multiplied! Top top ten, if you know what I mean. Coronilla, wonderful, the bidens, amazing, Silly Cow, funny and beautiful. Great! 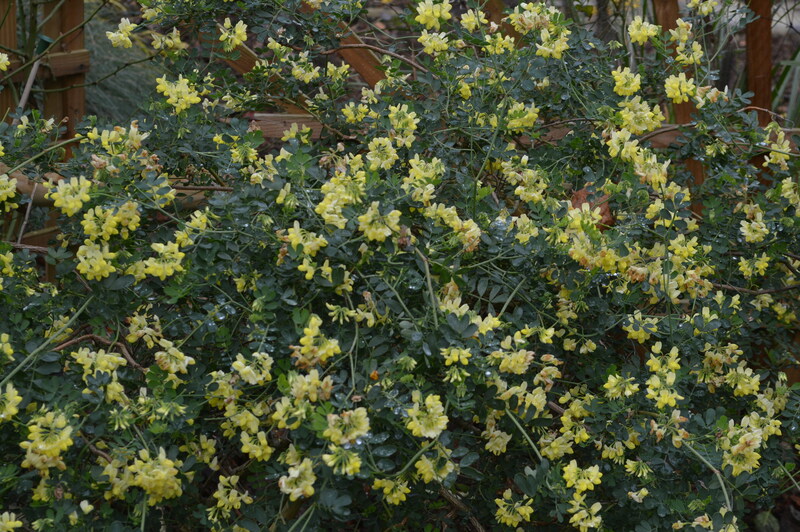 Coronilla is a wonderful plant, it would do well in Devon. The Bidens is a great success and yes, Silly Cow is fun; the grower named it after a friend apparently. A funny name for a friend. I wonder what he calls people he doesn’t like. Oh you have some lovely lingerers Chloris. What a splendid array of chrysanthemums. I treated myself to a pinky apricot one by the name of ‘Esther’ which has just gone over. I must add ‘Barnes’ to my snowdrop collection. It looks most sweet. Oh yes, I have Esther too, it’s such a pretty colour. 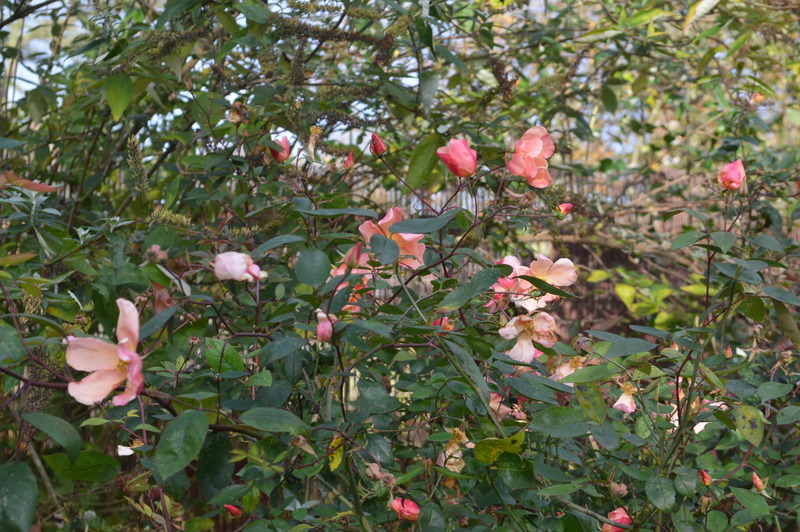 Barnes is a litle gem and always blooms in November. When mine grows a bit, I will send you a piece.. It is very pretty. I didn’t know that the bidens was invasive, I never came across it before. I don’t mind if it spreads though, it is so pretty. Thank you for joining in and sharing your lovely November treats. This is a fine idea for a meme. Sadly we have not blooms at all in November. I will have to wait until April to join in! Those roses and clematis are a sight for sore eyes at this time of year. Will the roses survive the snow you’ve had, or is that it until the spring?